The DSi’s audio software similarly hits multiple notes. As a game enhancement, it improves the game’s sound quality. As a convergence device it offers owners the benefit of a voice recorder and MP3 player in the same package. For novelty, during playback, the pitch and pace of sound files can be adjusted too. A faster main processor supports the new features but battery life, compared to the DS Lite, is less substantial. The DSi has been a popular platform in Japan since its launch. More than 170k units were sold in the first two days of sale according to Enterbrain. About 1.6m units were sold through the company’s fiscal third quarter ended in December 2008, according to Nintendo. Recent data from Famitsu showed 51% of Japan’s best selling software in 2008 were DS games. Nintendo had been holding off bringing the DSi to the US because sales of the older, 2nd generation DS Lite model, which went onsale in 2006, were still showing strength and resillience. That hasn’t changed. 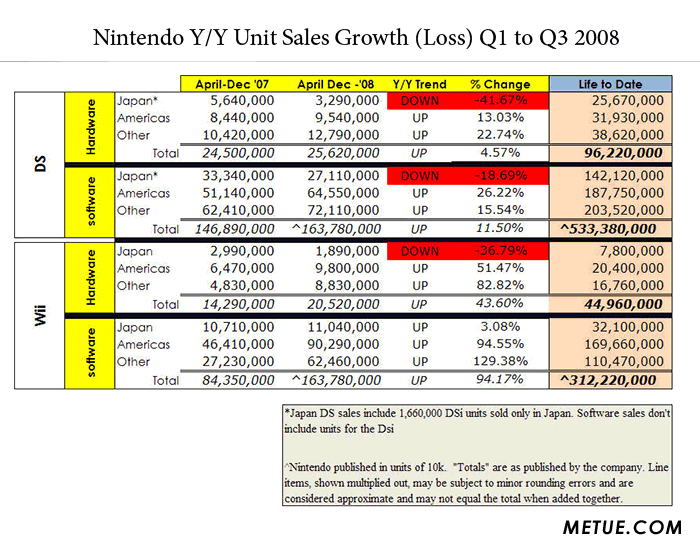 The DS Lite is still selling very well: for the first three quarters of Nintendo’s fiscal 2008, cumulative DS sales in the America’s were up 13% year over year (see table). More than 31m units have sold life to date in the region. In January alone, U.S sales topped 500k units, better than any other platform aside from Nintendo’s own Wii. (December sales were a record breaking 3.04million units). Most prior DS games are compatible meaning a library of more than 850 titles will support the DSi launch. Game Boy Advance titles, and games with accessories requiring the Game Boy Advance (GBA) slot, are not supported. The GBA slot has been removed. 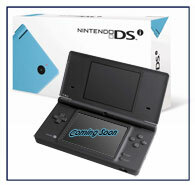 The slightly larger screened (3.25inches instead of 3.0) , and thinner (about 12%), DSi will be sold for $169.99. Initially, color choices of Blue and Black will be available – perhaps fitting choices given the bruising Nintendo’s caused some of its competitors.